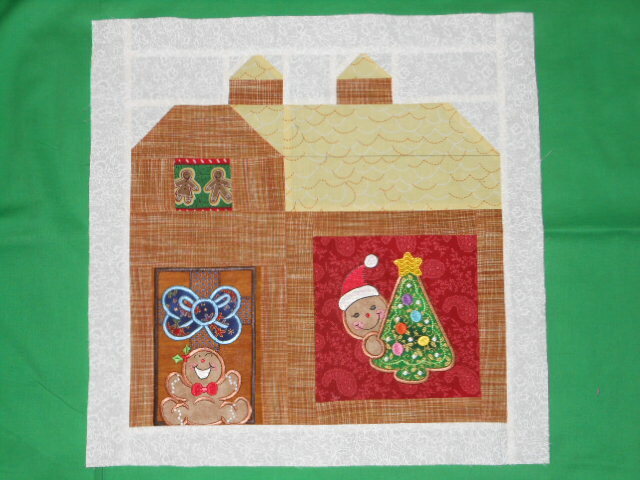 Going to make gingerbread barn block for quilt block exchange at our LQS. The pattern is from the Quilty Barn Along from the blog Bee in my Bonnet. Yellow roof or Blue roof (ignore black line on yellow roof) -- (sorry no mix or match of other elements...it's based on how the blocks look now). These are large 16 1/2 by 16 1/2 each. The green background is just so the edges show up more, it's not part of the block. I (well Dad wasn't) happy with the darkness of the "window" and the door didn't show up too well. So we tried again with the blue roof barn and made some color changes. I will make 12 of them the same for our exchange. We "drew" months and I got December. I didn't want the standard Christmas theme so I thought the gingerbread would work for most anyone. I like the blue roof, looks more like snow. Is it possible to find a tone on tone white with sparkles that look like newly fallen snow? Yup, I like the 2nd better, cute pattern! I like the 1st one best. I like the yellow one best..but in my end of the country the roofs are red..LOL have you tried a red roof? I like the first one. Looks like its going to be close call here. I like the first one because of the roof color. Both are very very cute!!!!!!!!! I prefer the yellow roof. looks more like a roof than the blue. I prefer the yellow roof block, all the colours pop for me. Of course they're both darling! Very cute block. I like the blue roof, but I also like the bow on the first barn. The blue outline looks neon to me. Do they all have to be the same? Maybe you should do half one color and half the other. I vote for the blue. The yellow is too pale. I like the yellow roof. Looks like we're not much help! IMHO the blue roof doesn't look like it is attached. The brown of the top part of the barn does not recess behind the roof. It seems to be floating. They are very darling. Well I really like the yellow roof but I like all the other elements better in the 2nd one. I would choose the first one because the yellow seems to belong and the blue doesn't. I agree that the blue roof appears to be floating. With that being said, I'd be happy in any exchange where I received either of these blocks. Please show us all the blocks you get from the exchange. I think this sounds like a fun exchange and could make a wonderful calendar quilt. I like them both. If it were me I would do them all different. Love the gingerbread idea. Maybe a Santa in the window or a snowman outside. Thanks for all the comments. The blocks all have to be the same is part of the guidelines. The brown for the barn is a homespun (and hard to get straight without it wiggling) and I'm thinking of going a whole different route. 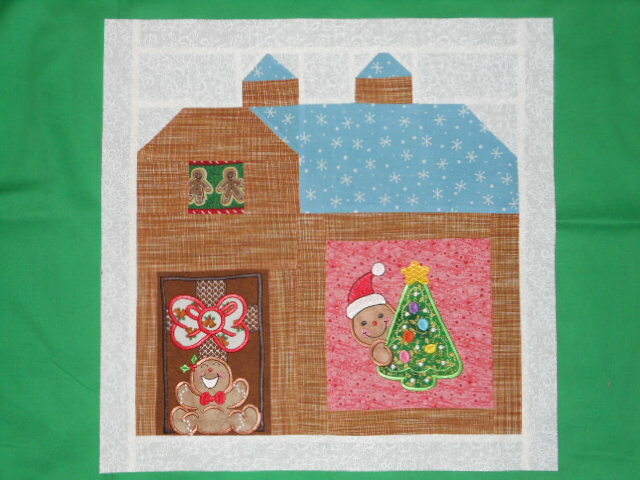 I have some wonderful Sunbonnet Sue Christmas designs and might just swing completely over to that and use some "barn wood" dark red fabric for the barn and criss cross gray graphics for the roof. I think I like the yellow roof best because it makes the bow and Santa etc pop a little more. But I honestly could go with either one. Very cute.